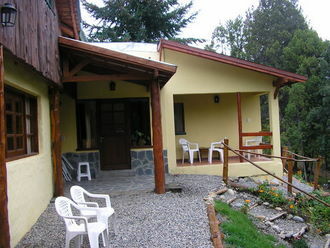 El Bolson is a family oriented summer playground and has a wide variety of accommodations - more than most Andean towns. There are a few first class hotels, but most accommodations are B & B's, hostels and camping resorts - camp sites/cabins with pools, playgrounds and recreation areas. 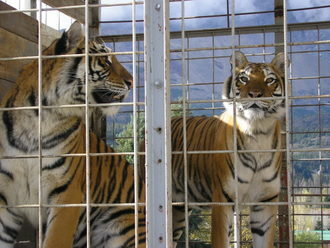 During my stay there was even a traveling circus! This exceedingly comfortable Hostelling International hostel is several miles outside El Bolson on the way up to Cerro Piltriquitron in an upscale area of semi-secluded mountain side homes. The hostel offers transportation from the bus station during the off-season - simply call the hostel from the phone center at the station. Walking into town took about 30 minutes but a taxi is less than AR$20 (US$5.25). 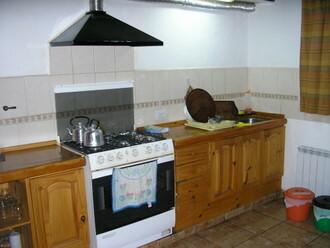 The hostel itself is set back from the road within the forest with landscaped grounds. 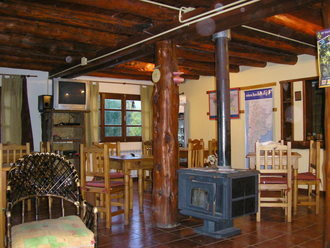 It’s a modern chalet style building with a well designed sitting and dining area. The kitchen is large, modern and better stocked than most hostels with pot, pans and tools necessary for real cooking - especially using the fantastic local produce. The rooms - both dorms and private doubles - have baths and comfortable beds. The hostel is spotless! I had reserved a private room for AR$90/night (US$24.70). Yet since this was off-season, and there were few people in the hostel, they gave me a 4-bed dorm, with bath, - with an understanding that if, for some reason, they needed to bunk another visitor in the room I would be willing. I was only charged AR$45 (US$12.35) for the dorm bed. I had the room to myself for the all too brief two days I enjoyed El Bolson. The Hostel offered laundry service, common among Argentine hostels, but, unfortunately, the laundry was hung to dry in the separate owner’s house and was returned reeking of cigarette smoke. The hostel was located on the hill side and the road entrance for the climp up Cerro Piltriquitron. The mountain is a heavily wooded environmental preserve topped by dramatic shear walls of jagged rock. It is these peaks that are identified as an Earth energy center. 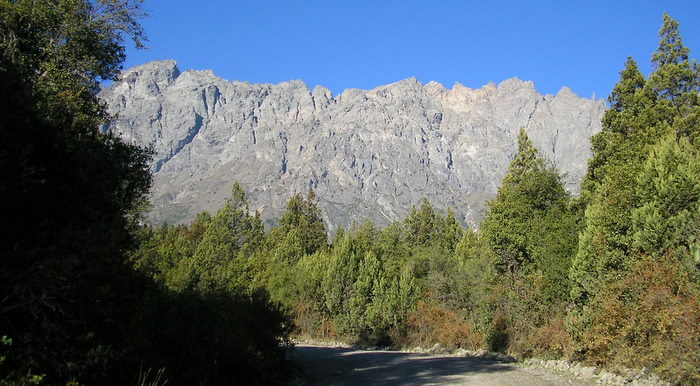 It’s a pleasant, steep 5-mile walk through silence up a couple thousand feet to the base of the rock walls and some nice overlooks (miradors) that give you a panoramic view of El Bolson and the lush narrow valley below. You can picnic at the miradors. After resting, another 40 minute walk brings you to the Bosque Tollado (Sculpted Forest) which contains 31 fascinating carvings out of tree stumps, all made by local artists. Many similar sculptures are scattered throughout El Bolson and northern Lake District towns. If walking 5-miles one way is not appealing, any taxi will take you to the miradors and you simply walk the 40 minutes to the Bosque Tollado. There is always at least one taxi waiting at the mirador for the return trip to town.